Jake Peavy poses for yours truly on a rainy Saturday in Glendale, Arizona. I had a lot of fun working with Jake Peavy a few weeks ago… After discussing the concept for our first program cover with our Design Services staff, I came up with the idea of focusing on the intensity that Jake not only brings to his game, but has brought to the Chicago White Sox after being acquired from the San Diego Padres late last season. I was hoping to bring this out by incorporating simple, yet effective lighting and shallow depth of field in order to bring the readers attention to Jake’s eyes. My concept made it through our decision making process, so now it was simply a matter of putting it all together and getting it done. Peavy in action during his White Sox debut late last season. Spring training is a great time to get things done. The mood is laid back, and everyone has more time available for projects like this than they do once the season starts. Still, coordinating everyone involved can be tricky. We decided to set up this shoot for the Saturday before “photo day”… a day set aside at every camp in order to take the standard publicity headshots that are used in media guides, on network television (I’m sure you’ve always wondered where those headshots on Sportscenter and The MLB Network came from, didn’t you? ), in video games, you name it. It’s also a day that moves at a crazy pace where 60 headshots taken in a hour and a half isn’t all that uncommon. Some camps get it all done in an hour! That said, it’s not a day that is conducive to bringing out ones creative side. Ask anyone who has covered photo day and I’m sure they will agree. Still, it is a very important day for many reasons, just not for accomplishing a cover shoot! 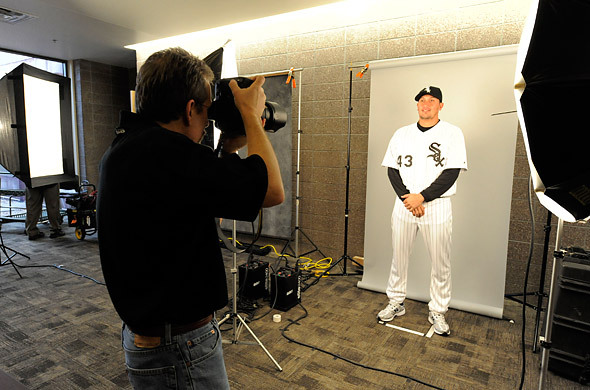 The "Photo Day" experience... Ron Vesely makes Freddy Garcia's headshot for Major League Baseball. When Saturday rolled around, Jake’s timetable was still up in the air. I knew it would most likely be a last second decision, so around 11am I decided to start doing a little location scouting. Our Glendale facility at Camelback Ranch is beautiful, but there isn’t what I would call “studio space” readily available. As Gareth Breunlin (our Manager of Design Services) and I began our search, we got a call to let us know that Jake was done working out and would be ready to go in 15 minutes! Time to act on instinct. Luckily, I had visualized in advance what I wanted to get out of the shoot, so now it didn’t matter all that much where I set up, but how fast I could get set up! I love simple lighting. I knew I would use one Chimera soft box as my main light, but I just wasn’t sure if I would use a reflector, secondary umbrella or go without a fill source at all. I quickly set up my “studio” in the hallway leading from the major league side of the facility to the minor league side. The two sides are like night and day, and there are reasons they are separated and very different. You earn your way to the major leagues, and when you do make “The Show”, you get to enjoy all of the perks that comes with making the big leagues, like not having to pay for your own Gatorade anymore, for example. Sometimes it’s all about the little things. After popping a few test shots off with Gareth, I decided to go with no fill and wrap the light from the Chimera box around Jake’s face in order to throw just a touch of light into his opposite eye. Minutes after we made the final decision, Jake showed up ready to go. After going over our concept with him, he was enthusiastic and more than gracious as we spent all of 4 minutes making the cover image. 4 minutes doesn’t sound like much time, but when I think back to the days when I shot my portraits with a Hasselblad, many times once I stopped shooting to change a 12 exposure film back, the shoot was over. So 4 minutes was just fine for me, as I’ve grown accustomed to working within relatively short time allotments. I guess 25 years of working on tight deadlines with athletes and other celebrities might alter your expectations. The final product... Edition #1 of the 2010 Chicago White Sox game program. Jake was great to work with, the shoot was a success and all was well. Before you know it, the deadline to shoot the cover photo for the second edition of our game program will be fast approaching, so it’s time to start planning. It’s hard to believe, since the season hasn’t even started yet and the team isn’t even back from Arizona! This entry was posted on Wednesday, March 31st, 2010 at 3:39 PM	and is filed under Chicago White Sox, Published, Sports Photography. You can follow any responses to this entry through the RSS 2.0 feed.